Major web buzz now for Canon’s newly-announced 5D Mark II, the 21MP, 1080i HD video- and stills-shooting machine. This thing will shoot 12 minutes of HD video that’s stored as .mov files. The website NRK Beta reports the resulting files can be dropped into Final Cut Pro with no conversion for right-away editing. 1. The 5D MKII camera produces the best stills in low light that I’ve ever seen – what you can see with you eye in the worst light (such as sodium-vapor street lights at 3 a.m. in Brooklyn) – this camera can capture it with ease. It has the potential to change our industry. Nikon released its stills-video composite a few weeks back, signalling the start of yet another technological revolution. I thought, at that time, the Nikon was an interesting transitional tool in the coming together of stills and video at a professional level. Canon appears to have given that revolution a major bump. The question now is whether to spend $2,700 (body only), or to wait to see what happens next. 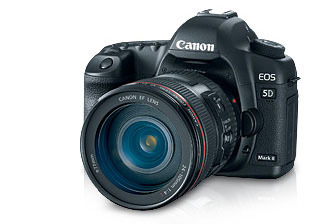 Update: Multimedia Evangelist has many Canon 5D-related links. I would suggest to wait – unless you need this camera or the Nikon D90 right now for at least two or three paid shootings and you are very sure, that there are more paid shootings coming. If you don’t need one urgently right now, I would rather wait because it is an ‘old’ wisdom in these technology century never to buy first generation products. And the other ting is: Will this become consumer standard or just a niche product with uncertain future? Remember: DAT and DCC, Floppy Disk foto cameras, Betamax vs. VHS, etc., etc., etc. So wait until other companies priduce such cameras and by that time, Canon and Nikon will have introduced their second generation products (compare Mk. I and Mk.II or Nikon D70 and D70s). Some frustrated prosumers and consumers even say, that they feel being Beta-Testers for company products rather than buying well tested products. Of course that is much more to happen with consumer products rather than with prosumer or professional products like these Canon or Nikon D90.